Rockman Corner: Feast Your Eyes on MM25 Preview Pages! Feast Your Eyes on MM25 Preview Pages! Over on Capcom Unity, Brelston has posted four images from MM25: Mega Man and Mega Man X Official Complete Works. These pages are just a small sampling of the book's newest material. Toru Nakayama is responsible for my personal favorite of the lot (the colors!). Click here to check out the other pages! Oh gawd... 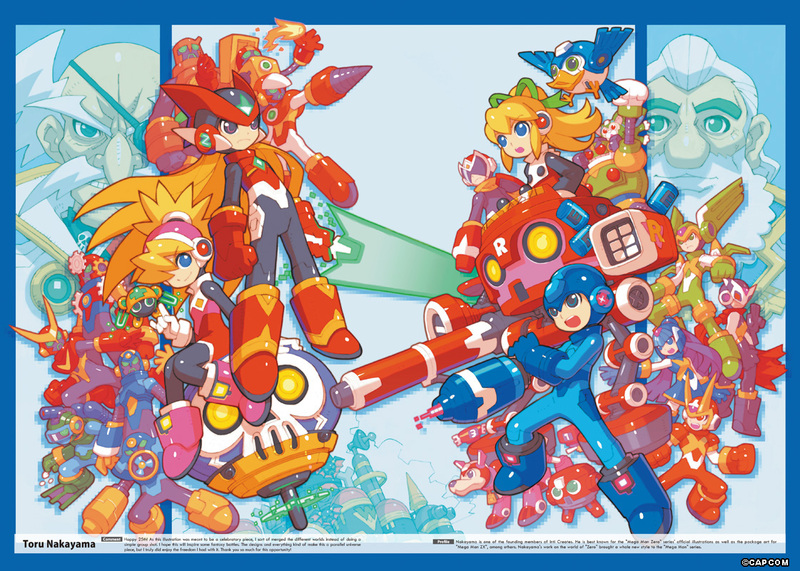 I'd love it if the new games were based on those designs... Zero/ZX series artwork is SO nice looking! Love that style. I could stand the next classic series entry having the Zero look. A remake of one of the classic series Mega Man games done in this style would be so awesome! This guy's art-style is ok, but I think I like Keiji's original designs better and would not want to see them replaced. An All-Star Wily Vs Light game, that would be awesome. Oh, God! My eyes are burning! Megaman Zero is a sufficient eyesore, but to taint the real Megaman with that creepy Roswell pedo-happy style is a total sacrilege. So Ciel is Wily's version of Roll? Nice! Ciel's truly the Wily version of Roll and Light together in a sense since she was searching for Zero at the time. The classic era robots and X-Guardians are scratching their heads about why a human joining force with Wily's army especially Zero. Would've make better sense if Alouette joined in the fun with Zero's group since she loves him as her big older-aloof brother. So both Ciel & Alouette are the Wily versions of Light and Roll metaphorically.